Femto is a miniature bass reflex loudspeaker designed by Bernd Timmermanns. The speaker is equipped with a Vifa 8 NE 125/4 full range driver. Two versions are available: Femto in a normal bass reflex cabinet or Femto 5 with a high pass capacitor in series to the full range driver. The Femto 5 has roughly one liter more capacity and is capable of producing lower frequencies than the Femto. The crossover consists of a wave trap in series while the Femto 5 contains a capacitor in series. The Femto's frequency response is flat, and the decay within the medium frequency range is ideal and, therefore, excellent for a full range driver. "The Femto was not reviewed on the author's desk but in the listening room and connected to the reference system. 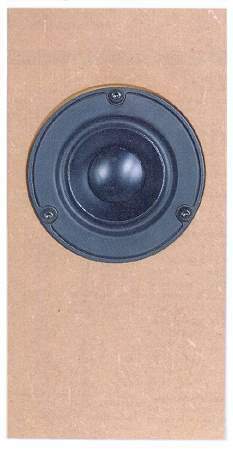 With just below two meters the chosen listening position is in line with speakers of this size. Both Femto versions clearly show that they are way more than just nice sounding PC miniatures. These speakers reproduce music like grown-ups. Ok, you won't get a party going with them.